These carriers offer tapered nylon wheels and round nylon body that moves within the slot of the privacy cubicle track. 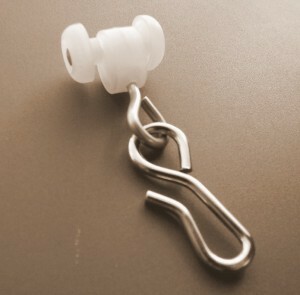 The plated steel hook rotates freely on a swivel. This cubicle track carrier is designed for use with a privacy cubicle track that is 1.12 inches wide x .75 inches tall. The overall height of this carrier from the top of the wheels to the bottom of the hook is 2.5 inches, the wheel diameter is .53 inches, and the axle length is .92 inches. This carrier or roller is available in packs of 14 for $15.00. For quantities of 1000 or more, we can offer bulk pricing as well. Our goal is to provide whatever curtain track hardware our customers need. If you have a part you are trying to match, and don't see it on our site, call us or send us a picture and there is a high probability we can source it quickly. The addition of this hospital roller carrier is an example of just such a scenario. We listen to our customers, and when we hear a request more than once, we move to meet the demand. Interested in a complete privacy cubicle track system? Take a look at the 88001 track, which is a versatile commercial grade hospital track commonly used in commercial and medical applications.